Today I want to show you more opportunity for getting DoFollow backlinks. The blog sites that am going to list below on this article have LUV comment system in them and they are DoFollow comments. 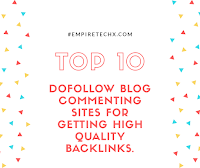 In my previous article on how to get high quality, natural backlinks I listed blog commenting as one of the ways of getting high-quality, natural backlinks. If your a newbie and don't really understand what backlink means then you have to read this post better explanation of backlink. And you can also drive a lot of blog traffic to your blog using this 9 powerful tips for getting more blog traffic. The blogs am writing about have the commentLUV commenting system installed in them. So whenever you want to comment on these blogs you will need to put in your own blog URL. Then when your comment is published your blog site URL will be automatically added to the end of your comment. Since your comments have your blog URL on them its best to comment naturally with positive remarks. Don't try to spam the comment that means leaving links on your comment. This is to avoid you comment been rejected by the blog admin. The list below is blog sites with DoFollow commenting backlinks. And the blog sites are all auto approval blog commenting sites. These means your comment won't be moderated but will be published automatically. So avoid leaving spam on your comments. Enjoy your blog and keep ranking higher on search engines.